Do you spend hours marking errors on a set of writing assignments only to see those same errors again on the next assignment? And the next? Does it frustrate you so much than you’ve considered throwing in the towel? Don’t change your career; just alter your job description a bit! Instead of a being writing teacher, consider becoming a writing coach. I love analogies, so indulge me if I seem to digress. My 12-year-old son Beck plays golf competitively. Even if you know nothing about golf, I’m sure you know that every sport involves a variety of different skills. A player who masters these skills enjoys success in his or her sport. Writing, too, involves a variety of different skills. A student who masters these skills enjoys success in his or her writing. At each of Beck’s golf lessons, his coach chooses some area of the game as a focus. It may be putting, chipping, or hitting the ball off the tee. Then he focuses even more. If Beck is working on his tee shot, his coach watches a few swings and makes one or two adjustments. By focusing on these little details, Beck is able to improve his tee shot. Perhaps it’s still not perfect, but his coach will tweak a little something else next time. Imagine what would happen if the coach watched Beck play 18 holes of golf and then told him everything he had done wrong during the entire round! Beck would be frustrated, he would have learned nothing (except that he’s a lost cause), and he would probably not play any better the next time. Seems ridiculous, doesn’t it? What coach would do that? Yet, that’s the approach we typically take as writing teachers. We assign an entire essay and then tell students everything that’s wrong with it (and possibly point out a few strengths). Students are frustrated, learn nothing, and fail to improve the next time. Sounds crazy, right? But does Beck’s coach say, “Great job with your tee shots today, but your chipping is really bad” when Beck wasn’t even working on chipping? No, his coach evaluates the tee shots and saves the chipping feedback for another lesson. I’ll bet it drives the coach nuts to see other bad habits and not correct them all at once, but he knows that improvement comes from mastering some aspects of the game rather than floundering at all of them. Eventually, if given the chance to focus, mastery will come in each area. As writing coaches, we must also remember that every student may not need to focus on the same skills. While one student may need to focus on parallel structure in this week’s assignment, another might need to focus on avoiding sentence fragments. If Beck’s back swing is flawless, his coach doesn’t focus on it anyway just because his other students are struggling with it. Coaches differentiate very well. Students regularly toss around such statements on the playing field of the writing coach. SPECIAL THIS WEEK! 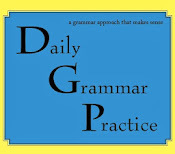 In honor of this week's blog post, you can get Focused Writing or the Burnette Writing Process Teacher's Manual for just $25 (instead of the regular price of $36.95) if you order online at www.dgppublishing.com by August 1, 2013. Welcome to Must Love Teaching ELA! On this blog, our authors will be sharing insights, motivational messages, and practical teaching strategies for teaching English/language arts. We hope you’ll find the posts to be inspiring as you encourage your students to love their language and to wield it well! If you have a topic you’d like us to tackle, please let us know. This blog is for all ELA teachers, so we want to address your specific areas of interest. Also, if you’re interested in being a guest blogger, please send Dawn an email at dburnette@dgppublishing.com with a brief bio, a topic idea, and a short writing sample. Be sure to subscribe to Must Love Teaching ELA so you don't miss any of our posts or any of our great give-aways! And if you have friends who love teaching ELA, please share our blog with them, too.